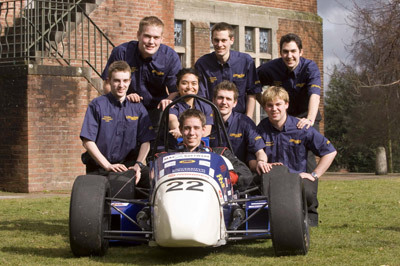 The University of Birmingham Formula Student Team (UBRacing) competes in the annual Formula Student and Formula SAE student motor racing competitions. Teams of engineering students design, build, and race small single-seat racing cars powered by high performance motorcycle engines. For the 2004-2005 season, UBRacing took on the challenge of designing a completely new car from a clean sheet of paper. "This wouldn't have been possible without virtual product development capabilities from MSC Software", according to Ben Michell, Technical Director and Vehicle Dynamics Engineer. 1) The team had identified a handling problem on the 2003 car, which manifested itself as a very poor turn-in response. Eliminating this problem was a key design target for 2004. Adams/Car allowed the vehicle dynamics team to assess the effect of different levels of caster angle on the load transfer characteristics of the car, and also to ensure that the required steering torque wasn't too high for the driver. An initial value of 10 degrees resulted in steering that was too heavy so a value of 8 degrees was settled upon - still double the previous year's value of 4 degrees. Adams/Car also allowed an assessment of roll centre height and migration. UBRacing was able to keep the roll centre around ground level and within the track width under all operating conditions. 2) The second area of development was the rear suspension and its integration with the rear chassis structure and driveline. The main design target in this area was to optimise the packaging of the three systems rather than attempting to optimise the performance of any one of them. This meant that a compromise was required between the suspension hardpoints and the location of the driveline. With the driveline design engineer working on a full digital mock-up of the car in CATIA, and the suspension engineer working in Adams/Car, it was possible to model the suspension as a wireframe on the car model and to modify the key positions until it no longer interfered with the driveline. An Adams analysis then assessed the effect on the suspension and suggested design changes. A number of iterations of both the suspension and driveline were possible in a much shorter time than in previous years proving the worth of integrating two CAE packages within a virtual product development framework. The work done in Adams/Car paid dividends on the track when the car achieved the 8th fastest lap of the competition out of approximately 65 competing cars. This was all the more impressive given that the car had only had 2 hours of testing prior to the competition as a result of manufacturing delays. The set-up decisions were made based on the Adams analysis and resulted in a car with neutral handling characteristics and excellent turn-in response compared to the 2003 car. Having gained an understanding of Adams/Car to explore relatively simple design problems, the 2005 season team hopes to extend analysis to the full-vehicle level to look at the effect of differential bias ratio and damper settings on transient handling. In other areas of the car, Adams/View will be used in order to optimise the engine valve train for modified cams, and we aim to use MSC Patran & Dytran to develop a more sophisticated impact structure for the car. In 2005-2006, Ian Haigh took the lead role with Adams/Car and is shown here with his UBRacing teammates. Ian indicated that, due to his team's inexperience this year, they didn't want to make major design changes to last year's successful car and so they did relatively little 'real' suspension design. That said, Ian still felt Adams was extremely useful in establishing the packaging for the car, and hopes to take full advantage of it next year in the design department.